You can hack facebook account successfully! Find Password. How to hack facebook using kali linux : CREDENTIALS . Go Sportsnet. 981K likes. United by Sport. . Jacksonville Jaguars star running back exited Sunday's Week 1 matchup against the New York Giants and did not return.,Get the latest science news and technology news, read tech reviews and more at ABC News.,Use our hacking portal to hack Facebook Accounts easily and for free. We specialize in hacking facebook passwords and provide services to hack fb online. Go Hack Facebook account password I go to SamHacker.com hack Facebook password hack WhatsApp account instantly without downloading hacking software, it's free,Do you know ,you can hack facebook password with one fake fb page(phishing). In this tutorial we will use Social Engineering tool i.e Credential Harvester .,Facebook Password Sniper is the best facebook hack tool available. It uses Rainbow Tables to crack the password in a short period of time. Hackers use a variety of methods to hack facebook accounts on user end. While hacking a facebook account at server level is next to impossible task, some have achieved this feat in the past. In this article, we will only discuss methods which are publically available and everyone can use. Kali Linux is a linux based hacking platform which is used to test security of systems. It is equipped with various tools used by hackers to invade a security system. These tools range from simple brute force crackers all the way to most advanced hacking tools like kismet, nmap and Social Engineering toolkit. These tools have made it easy for us to hack into a facebook account. Learning kali linux requires patience and advanced knowledge of computer languages. If you are interested, you can learn kali linux at workshops we conduct regularly. Watch a video on Kali Linux based hacking. Phishing is a basic technique used by hackers to gain access to the password of the victim. This is the most used facebook id hack in the industry. 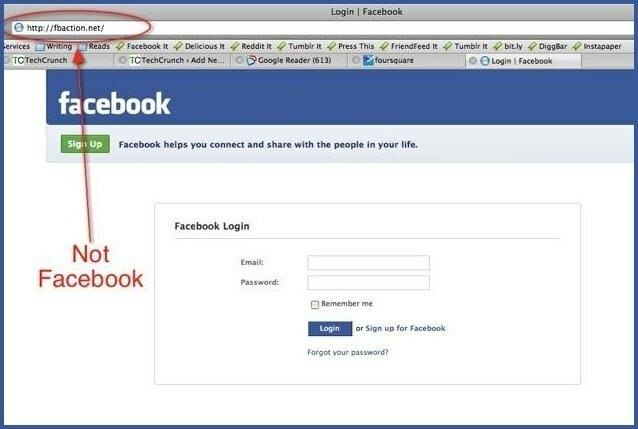 In case of facebook hacking, it involves creation of a page which is exactly identical to facebook login page. The address of this page is also very similar to facebook.com such as faceook.com (without b). Next, the hacker sends this page address to the victim in email or message asking to login to their facebook to get some incentive. If the victim follows the fake link and enters the password on the fake facebook login page, the password is sent to the hacker and victim is referred to the original facebook page logged in so he the victim doesn't get alarmed. The hacker can then use the facebook password to gain access to the victims facebook page. Learn more about phishing. Session highjacking is a rather advanced technique of hacking facebook account. As the name indicates it means to hack the active login session details of the victim using infiltrative softwares (trojans) and to use this information to login to facebook. It involves the software to find and decode the cookies stored on the device of the victim and either decode the cookie information or send the cookie as it is to the hacker which the hacker can then use to hack in to the facebook account of the victim. This is a fairly advanced technique and requires a great deal of advanced background knowledge about programming. A keylogger is a small software which you can install on any windows system. This method requires no programming skills and is one of the most easy method to hack a facebook account. Once installed, it can record the keystrokes pressed on any pc. This means that anything the victim is going to write using his keyboard, it is going to get recorded. It includes email, passwords, phone number and other sensitive information. This inormation is then sent to the hackers email address and he can use the login information to hack into the facebook account of the victim. This methods is fairly easy provided you have access to the computer or device of the person you intend to hack. Learn more about keylogger. Hacking a facebook account is a fairly difficult task. On one hand there are hundreds of fake websites on the internet which claim to hack any facebook account within seconds. On the other hand there are quite a few working websites and methods which actually hack a facebook account. Such methods are extremely difficult to find since they are cloaked away by fraud websites which are nothing but a scam. We have, however compiled a list of working facebook hacks which you can use to hack into a facebook account. Use these methods on your own risk. Some of these methods require advaned knowledge in some programming languages. Other are as simple as installing a program on victims device. You can Learn more about them in detail on internet. Do not visit following websites to get access back to your Facebook account as they are scam and wont get your account back. You have not opened this page from Google Search Result so ticket entry box is not available. In order to view the ticket entry box. Go to Google.com, Search for xtrahack hack facebook and open the website http://www.xtrahack.com from Google Search Results. Go to the profile ID on facebook of the victim you want to hack. If you are on a mobile device with the Facebook app installed, open the profile of the person you want to hack in facebook app. Paste the copied link in the facebook hack box above and click the hack button. The hacking process to get access to victims account will be initiated. An admin will be assigned to your case and multiple, manual as well as machinic attempts to crack the security of the victim's account will be initiated. (It can take from few minutes to few hours). The hacking box will only be available if you open the website from Google. Lets face it. Facebook hacking is in extremely high demand nowadays. When it is a time of virtual identity online. People are living two lives, one physically and other virtually. Online identity has taken over as a global portfolio of a person. New contacts, new colleagues, new friends and relationships, all find their place in social media one way or another. All the important information, personal data, intimacy and secrets are locked away on servers of Facebook. In other words, if someone was able to gain access to this data, it can be used as, please. From heartbreaks to destroying one's lives. Facebook hacking can not only make you aware of what other people think about you. But also uncover secrets and truths which can help you to move on in your life. From spying on your children's activities, getting your hacked facebook accounts back, reading and looking over the life of your girlfriend, everyone resorts to facebook hacking at one point in their lives. But hacking a facebook account is not so an easy task. There are hundreds of millions of people looking to hack facebook accounts and only a few exploits left to successfully hack. As a person who is not so technical with computers, hacking can be a very tricky and confusing process. It's not as simple as shown in movies and certainly not as easy. Hiring a hacker can result in loss of hundreds of thousands of dollars with a possibility of getting scammed in the process. Therefore, we at xtrahack.com have come up with a solution for all the people looking to hack facebook passwords without getting into any hassle. Our facebook password hacker is a small tool which is available on client end as a small hacking box. What we require of our users is to simply provide us the victim's profile address. This hacking box is linked to our state of the art hacking tools some of which even require manual administration. Our administrators are working round the clock to make sure no account remains unhacked. People have hacked over 70,000 facebook accounts using our hacker. Our facebook hacker is currently the only working hacker on the internet. The incidences of hacking of Facebook accounts of famous celebrities are increasing by the day. The reason of which is revolutionary increased interest in Kali Linux, a platform designed to test the security of a system but can also be used to break it. Some of the examples of these hacking include the facebook account of Enrique Iglesias, the renowned singer; Pervaiz Musharraf, ex-President of Pakistan; Arijit Singh, another renowned singer and so many more. The hacking of these celebrities is a strong indicator of the rapidly increasing exploitation of facebook hacking methods. Hack Facebook Account Online in 2 Minutes! If you have read anywhere that it is possible to hack a facebook account in 2 minutes, it is not true. There is no way to hack into a facebook account in two minutes. Hacking process is neither this simple nor easy. It requires both patience and time before hackers can hack into an account. We take anywhere between 3 hours to 3 days to hack a facebook account if it is hackable. Not a single hacking method available is efficient enough to crack the facebook password in 2 minutes. Our most efficient method is through a phishing attack which requires a good amount of time. However, one of our methods includes generic password trying which includes trying a number of passwords which people most commonly use. This method leads to a very fast result and can hack within minutes. There are a lot of websites which got banned due to such scam activities. For instance Hack Facebook Account Hayy was one of the websites which claimed to hack facebook accounts in minutes in exchange for money. Facegeek Facebook Hack is another website which claimed to hack facebook accounts but all these websites eventually turned out to be fake an were either closed or banned. Facebook Password Sniper is another renowned fake facebook hacking website which only claims to hack but tricks users into completing bogus tasks like spamming on public boards etc. How we hack a facebook account Facebook ID Hack. Unlike the hundreds of websites on the internet which claim to hack a facebook account with one click, we do not boast such bogus claims. Instead, we take the time to study the facebook accounts we hack. It means that we look for vulnerabilities in the security of their account. We try various attacks an techniques and if successful, we get the email and password of the Facebook of the victim. Throughout the process, you remain completely anonymous. All you need to do is provide us with the victims Facebook Address (facebook id hack). At any moment we are processing approximately 70-80 Hacking requests. Your request is queued and you can use the ticket number to find out the status of your request. Please note that you can only view the ticket entering box if you open this website from Google.com. If you want to become a facebook hacker, you can sign up for our training program where we will teach you to step by step to facebook hack online or any account you want. Phishing is a facebook hacking technique which is most common nowadays. In this technique, the hacker i.e. we create a fake facebook login page and make the victim enter the username and password on the fake page. In this way, the victim thinks he is genuinely logging into the Facebook account while in fact, he is sending this information to us. Learn more about Phishing Here. At anytime a user is browsing his Facebook feed, the information regarding his log in status and other information which tells a computer that he is in fact authentically logged in is stored in small files known as cookies. These are small encrypted files which hold very sensitive data. Highjacking these cookies can help us gain access to the victim's Facebook account. We can try to gain access to these files through protocol hacking and use this information to crack the facebook password of the victim. We then provide this hacked email and password to you. From time and time, when we are to hack a facebook account have the idea about the password of the victim through other hacking techniques and research, we employe brute force method. It involves sending queries to Facebook servers at very high speed. Once the correct password is entered, the FB account is hacked and we are given access. This method, however, is very resource consuming and is not recommended at all. We use it as one of our last resort to hack FB online. Similar to Session Highjacking, cookies are also stored on a mobile phone. Hackers can gain access to these cookie files and easily hack any Facebook account they want. It usually involves administering a small trojan program in the mobile phone which can then send the cookie information to the hacker. The 21st century is the century of mobile technology. With people all around the globe constantly shifting from bulky desktops to smart devices, the main focus of hacking has shifted from desktop-based hacking to trying to scrutinize cell phone devices. With closed source devices such as an iPhone, this process has become fairly difficult. However, as the security on devices proceeds to become stronger, so do the carelessness of people. Hackers use this casual behavior as their main weapon. Phishing attacks and 3rd party applications to extract secret information has become the mainstay of mobile phone facebook hacking. One of the most advanced and most difficult methods of hacking facebook with high success rate is DNS Spoofing. In this method, we gain access to the PC or Mobile device of the victim and alter the DNS records of the internet. This way any information which was to be sent to Facebook Servers will be sent to us. This hacking method is quite difficult but if successful, has a 100% success rate in hacking facebook. Cookies are small files which your browser stores in order to remember you on a specific computer and allow you to log in without entering your email and password. Facebook also make such cookie files on the device which can then be used to hack FB online. These files are locally stored on the device. Once hackers get access to cookies, it is only a matter of seconds before he can access the facebook account of the victim online. However retrieving these cookies is not an easy task as it may seem mainly due to fortified security measures on modern browsers, encryptions, and difficulty in obtaining the IP address of the victim's device. USB Hacking And Bots are other methods which are not employed by us but are fairly commonly used in hacking facebook accounts. But our facebook hacker app is by far the most successful way. You can learn more about them on the internet. Learn how to keep your Facebook Account safe and secure. Absolutely nothing. We hack facebook accounts to polish our programming and hacking skills. Over time we have mastered these methods of hacking. Our success rate lies between 70-80%. As already mentioned, we are a group of software engineering students with advanced security as our major. We try to improve our skills and better understand the security architecture of security wise challenging websites. Our aim is to improve our skills while helping people in need. Especially those who have lost access to their accounts and require a hacking service to get back the access to their account. Facebook has now segregated messenger from the main Facebook website. However both of them are still linked to the same account and in order to hack messengers password, the same hacking techniques are to be used. These include all of the above-mentioned techniques. In short, if you hack facebook accounts password, the messenger will be hacked alongside with it. Use our service to hack both. Hacking a Facebook account isn't evil. Yes, it's wrong but not evil. Hacking into a facebook account online is fun. You get to know the reality of your friends, girlfriends, boyfriends, family members, rivals and enemies about what do they talk to other people about you or what are they plotting against you. You get to know whether your Hunny-bunny darling is faithful to you or is cheating behind your back. Facebook conversations are a smooth way to know the reality of a relationship. Passwords are a real security threat. Over 80% of hacking-related breaches are due to weak or stolen passwords, a recent report shows . So if you want to safeguard your personal info and assets, creating secure passwords is a big first step. And that’s where the LastPass Password Generator can help.Impossible-to-crack passwords are complex with multiple types of characters (numbers, letters, and symbols). Making your passwords different for each website or app also helps defend against hacking.This password generator tool runs locally on your Windows, Mac or Linux computer, as well as your iOS or Android device. The passwords you generate are never sent across the web. Avoid weak, commonly used passwords like asd123, password1, or Temp!. Some examples of a strong password include: S2x4S12nLS1*, [email protected]$, 49915w5$oYmH. Avoid using personal information for your security questions, instead, use LastPass to generate another “password" and store it as the answer to these questions. The reason Some of this information, like the name of the street you grew up on or your mother’s maiden name, is easily found by hackers and can be used in a brute-force attack to gain access to your accounts. When you go on holiday, you wouldn’t leave your front door open to burglars – yet many of us are equivalently foolhardy with our online identities. As our colleagues at Brit Lab explain in the video above, there are three primary ways that hackers use to crack your passwords. Phishing scams are the most well-known – where a fake email (often promising instant riches) will send you to an apparently credible website that asks you to enter the secret code. The second involves clever guesses. The word “password” is still the most popular password, followed closely behind by “123456”. Even if you think you are being clever with a pet or family name, it’s not so hard for a hacker to guess from Facebook or Twitter profiles. Nor do references to popular culture – like the ship number from the USS Enterprise – take too long to guess; such choices are probably already lurking in a database of potential password hacks. When that fails, hackers can use sheer brute force: algorithms can power their way through 8 billion password combinations a second. One of these programs could have cracked a six-letter code within the blink of eye; 12 numbers would take just over three minutes. Legal disclaimer >>> The information on this site is intended to be used for legal and ethical purposes like research, education, journalism and educating the public. Our intention is to comply with any and all applicable laws. If you can provide legal advice, please let us know. Contribute >>> Have new or missing information See something wrong Use the comment section at the bottom of all pages, email or Twitter. Stay up to date >>> Follow us on Twitter. This section is intended to contain statistics on passwords leaks that are interesting or can be useful in terms of password research. Leaks of a large number of plain text passwords are most interesting, but also hashed passwords where most of them have been cracked, or smaller leaks where the users/passwords fit a specific profile or niche can also be useful. 2011-12 Renren.com plaintext N/A N/A N/A 2826611 4732799 59.72 % 100 % Pipal Passpal Passwords equal to 'NULL' was filtered out. 2011-12 duowan.com plaintext N/A N/A N/A 100 % Pipal Passpal ZDNet report Difficult to extract passwords from leaked files. 2011-12 duduniu.cn plaintext N/A N/A N/A 100 % Pipal Passpal Difficult to extract passwords from leaked files. This section is intended to contain dictionaries that are interesting in terms of dictionary/password research. I'm mostly interested in narrow dictionaries, or dictionaries it is clear how were made/generated, so that I can better learn what makes a good dictionary. Counter-Strike 1.6 - Русская версия Боты - Скачать CS 1 . Counter-strike 1.6 original bots 2012Counter-Strike e uma modificacao para o jogo de tiro em primeira pessoa Half Life desenvolvido por uma equipe independente em meados de junho de 1999. O titulo .,Counter Strike 1.6 download using torrent or downloading it directly via browser from rampage.us.lt is totally free - get it now!,Essa versao nada mais e que um MOD que vai deixar seu Counter Strike 1.6 mais que legal. Nesta versao existem varias mudancas, sendo uma das mais notaveis o .